My Place: Collages and a Tah Dah! For the collage theme over at Art Journal Journey this week I have continued using up old scraps and failed paintings. The above was a collage I started years ago and never finished. I think it was at the beginning of my tea bag painting phase. The trees are dried gum leaves. This collage is a combination of three failed works! I pasted them onto a large sheet of card and then added some leaves. The tea bag in the centre I left unpainted as I thought it might get a bit too busy. Now I don’t know if this qualifies as a collage as it is digital. 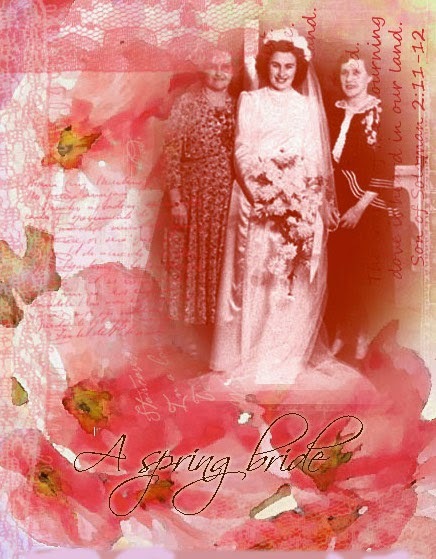 I used a watercolour of some apple blossom, a photo of my Mothers wedding day, (the two ladies with her are my grandmothers. Christmas is a time of family and I feel the need to honour these ladies as they are no longer with us.) I also used some bits of lace that I scanned. For Paint Party Friday, I finished the painting from last week thanks to a suggestion from Denthe and others. Denthe suggested that I paint the bird looking at the girl as if it was going to take it from her. That really hit the mark for me. I am going to call the painting The Last Flower. The birds are upset that she has picked it as now they will be hungry and there will now be no flowers to form seeds and feed the earth. I think the girl has realised too late what she has done in her mission to smell the beautiful scent. People who have looked at my last post for Sunday Sketches will recognise the bird as the Tui. There is a reason that I have been painting them a lot. My younger brother had a stoke 3 weeks ago. As children we were very close, but in late teenage years we became estranged. A couple of years ago I got in touch again with him and we have been developing a relationship again. As children we use to spend holidays with our grandmother and she still worked some mornings so we were dropped off at the National Museum in Wellington and we took turns at what we would look at. Dave was keen on birds so I drew them and he took notes from the displays. Then we would make a project sheet on each bird for our Grandparents. I think what we also like the most was when Grannie picked us up and took us to fancy restaurants for lunch. She let us choose whatever we wanted. I think that is where I got my love of fine food!! 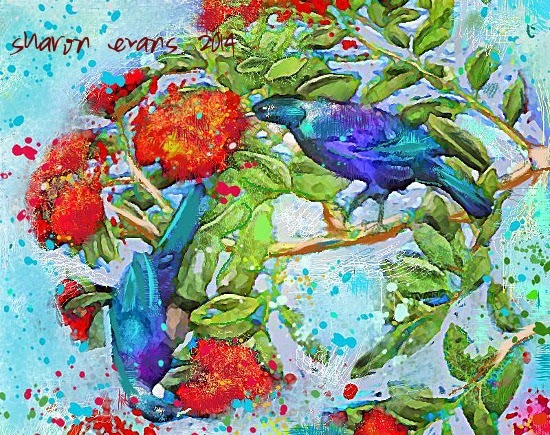 When we got in touch again Dave would send me photos of birds that live around his home in Canberra (Australia) His favourite NZ bird is the Tui, so I am painting a series of cards for him. Below is a painting in gouache that I am going to frame for him. It is so sad he is only in his fifties and his wife is dying of breast cancer. They had just got back from Mexico where they had gone for treatment for Liz. It is not working unfortunately; I think the stress of it all plus other family stuff caused it. So, if could please send your prayers or healing vibes to Canberra, I would be grateful. Hope you all have a wonderful week and thanks for visiting. Fabulous projects, each and every one of them. Happy PPF! Oh gosh- what a wide range of fantastic artwork today Sharon! So so beautiful each singe piece here.. and the beautiful digi piece of your mother's wedding is also pretty welcome since we accept digital collages as well! Happy PPF , HAPPY AJJ, Happy weekend ! 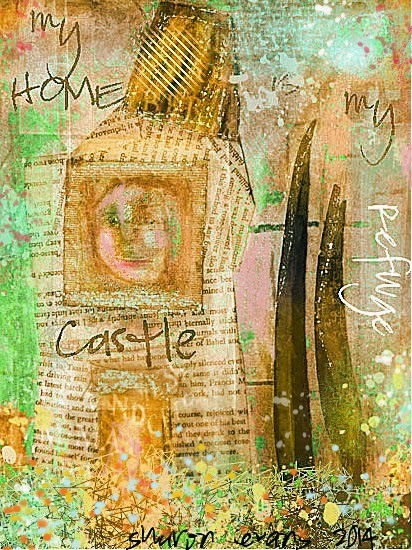 Thank you for being once again with us over at Art Journal Journey with your fantastic art! These are all so amazing, wow! 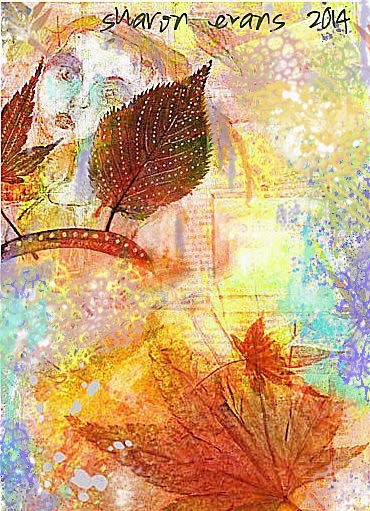 Your work always strikes me Sharon, so creative and beautiful, I love all of these, but my favourite would be that second one, the colours are so gorgeous and full of Autumn's mellow light! so beautiful and very creative the collages! I love the story behind 'The Last Flower'. All these projects are wonderful. I am so sorry to hear about your brother and his wife. Sending best wishes to you and your family. Love how you finished 'the last flower', its subtlety emphasizes it. Hope your brother will be ok.
Great finish to your painting by adding the blue Tui and I like your story even although it is sad. Love your collages with your "failed" paintings, they have a great sense of mystery. Beautiful work. You certainly paint birds in a most exquisite way, Sharon. I am sorry to learn of the bad news in your family. So sad. I hope things will turn around for them in spite of the latest setback. Saying a prayer for the young woman with breast cancer. 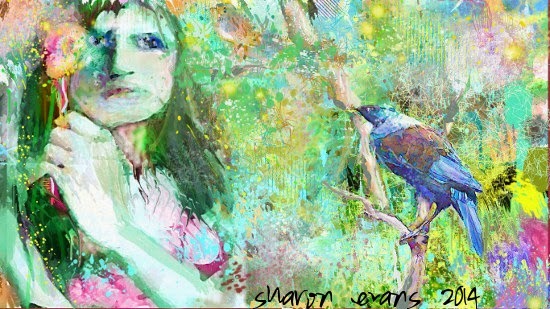 Wow, Sharon - gorgeous work! I love those birds and the one in the Last Flower really made the painting. Great work. Thinking of you and your family in AU. love your pieces ... especially the two with birds in them. love the bright colors! Oh sending love and light for your brother and sister in law! What gorgoues artwork and yes the tui fits in just perfectly! Sorry this is such a troubling time for you and your family! Love hearing your memories with your grandmother! A nice tribute collage too!! O wow how stunning is this. I particularly like the concept of collaging 'failed' projects! Love them all. Your collages are beautiful and your birds last Sunday are so fabulous. You are a very talented person- I think you have that color palette down to perfection. Beautiful art., I absolutely love "the last flower"...gorgeous, deeply meaningful..l and very special story about you and your brother. Sending comfort, love and healing to your family and loved ones and to you..hugs! oh yes, sending healing vibes to your family. I am so sorry to hear of what they are going through. your birds are a lovely gesture, straight from your heart and full of your heart. SHARON THESE ARE LOVELY!!!! I love your finished piece and the birds for your brother are truly beautiful! I very much love your birds and your collages are so unique. Definitely hoping for healing for your family. I'm sorry that this is happening. My prayers will are with them, and my best wishes! Your paintings are so beautiful and vibrant, he will love it. Love all your artwork - the paintings are especially gorgeous. I will pray for your family. I am sorry to hear about your brother and his family. Sending healing wishes. I love seeing your art. Each has a bit of mystery. I like that you have utilized failed pieces.... in that way they have not failed :) I am partial to the last piece. Best to you.